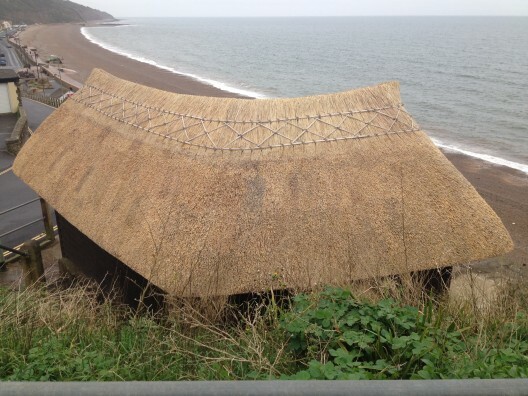 There are many fire membranes on the market ‘suitable for use beneath thatch’. Are they suitable? What’s the difference? Nearly all fire membranes are PU (polyurethane) coated. PU28 is still often asked for and is widely used to describe fire barriers within the thatching industry. PU28 was used as a development code for a new membrane product and this code has stuck with many membranes to this day. There are many formulations for a PU coating, some more economical than others. Some are solvent based, while most standard PU finishes would certainly fail a smoke & toxicity test. A membrane, PU or other may have a BS type test. What test? The testing it carries may not be an indicator of a product’s quality as some tests are not as robust as others and may not be reflective of the environment in which a product is used. Waterproof, water resistant and breathable. Waterproof can be defined as an objects’ capacity to be impervious – water won’t get in. Water resistant means water isn’t going to get in easily. An often used but nonsense adjective. Membranes cannot breathe. Nor can wine. We can. A ‘breathable’ membrane (or breather membrane) is water resistant and air permeable. The majority of air permeable products will have a high moisture/vapour transmission rate but will not breathe. Check if a product is waterproof and breathable – many are!! Looks and feels similar to a PU28 type membrane but with a far superior coating – a temperature resistant aluminised polymer system. Tested beneath a combustible material - thatch - to meet both BS476-3:2004 & BS EN 13501-5:2005. Designated as Broof (t4) – the highest performance in accordance within the European class – BS EN 13501-5:2005, which refers to four separate tests. The suffix (t4) indicates that Test 4 is to be used for the purposes of Approved Document B (Fire Safety) B4 External fire Spread. Water resistant and tested for air and water vapour permeability. Tested to meet the same smoke and fire toxicity specification for commercial aircraft. These are just a few of the tests TAS – Thatch Firewall Membrane carries. When considering a PU28 type fire barrier for use beneath thatch, it would be worth asking a few more pertinent questions. For further details and information about TAS – Thatch Firewall Membrane, please call the office. Rob Norcott of Thatching Advisory Services was asked by Listed Property Owners’ Club Ltd. to write an article for latest magazine. 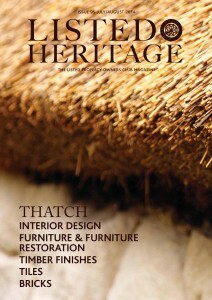 Listed Heritage Magazine is published by the Listed Property Owners’ Club for their members. This is a full colour, perfectly bound A4 production; it is published bi-monthly and distributed to 19,000 listed property owners. The Listed Heritage Magazine includes amongst other things: suppliers directory, members letters, shopping pages, events and properties for sale. The 4 page piece was centered around the importance of separation in construction on thatched roofs. The article also takes you through common causes of thatch fires, from old or faulty electrical systems through to bonfires or fireworks. It also discusses the various systems and preventive measures available such as Thatch Fire Board System, Thatch Fire Wall System; the use of Thatchbatts® and the Thatchsayf spray.